AMZScout tool has the extension for Google Chrome and web application. You need to install AMZScout extension to your Chrome web browser in order to use it. It has free trial period. Choose to install AMZScout Extension for Chrome. You will be redirected to Chrome Web Store. Click the button “+ Add to Chrome” to install the extension. Once installation is completed, you will find a new small button with AMZScout logo next to the address bar of your Chrome browser. There also be a notification about it. If you were not signed in to your Chrome account, you will see the message to sign in. To register your AMZScout extension after installation you need to sign in using a Google account, Facebook or with Chrome. Just choose the most convenient option and enter your login and password. Once you install the AMZScout extension you can use it instantly. Simply go to the Amazon page you wish to analyze. You can open any page, such as Stream, Gold Box, Most Wished For, $10 & Under and many others. Or just search for products by keyword. Then press AMZScout button next to the address bar of your Chrome browser to launch the extension. You will see a spreadsheet with all the products on the page. ◇ You can add or hide some columns and headers that are shown in the extension window. ◇ Click the Filter button to only show products that suit your criteria. If you don’t need to apply this filter, you can click the switch button near the Filter button. When the switch is blue the filter is off, when it’s orange your filter is on. ◇ Click the star button to add a product to the list of Favorites. You can easily check the Favorites list by clicking the Favorites button. ◇ You can click the ‘+’ button on the left from the product name and the product will be added to your Product Tracker (available in AMZScout web application). ◇ To open the FBA Calculator click on ‘Net’ or “FBA Fees” for a particular product. ◇ To view the price history, click on the product price. ◇ To view the rank history, simply click on the rank of the product in question. ◇ Here you can check the keywords for this product for which this product ranked well. ◇ Quickly copy ASIN number of the product. ◇ You can search for a similar products on Alibaba. “Find at AliBaba” button opens a new tab in your web browser with Google search results by Alibaba. Click on the picture of a suitable product and then click the button “Visit” . This way you will instantly open an Alibaba page with full product details. 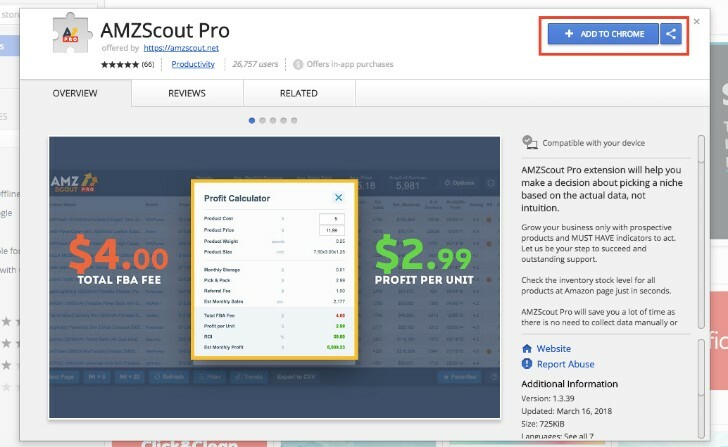 If you want to buy AMZScout extension click the orange button “Buy Now” in the right bottom corner of the extension window. Then, you will need to choose the type of license you want to buy: monthly, yearly or lifetime. 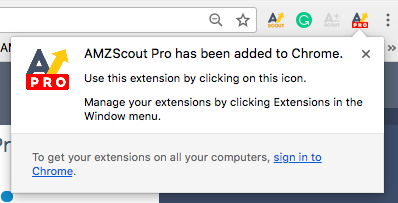 Note, by buying the AMZScout extension for Chrome you are buying only the extension. The web application nor its features are included in this purchase. The web application can be purchased separately. After selecting your license you will need to enter your payment details. Until the valid payment information is entered and the button “Buy” is not pressed, the amount will not be deducted. If you decide to cancel a subscription or to get a refund please contact our support team. You can check them using AMZScout extension. There is button “Trends” at the bottom. This option can work only for Amazon pages with search results, as it shows search trends for a particular keyword you entered. So, search the product on Amazon by entering a keyword in the search bar. Run AMZScout extension on this page and then click the ‘Trends’ button, now you can see a 5 year trend for this keyword. How to see the account information (licence)? To see your account and license information you need to run the AMZScout extension. Click the button ‘i’ in the top right of the extension window. You will see the information about app version, registered email ID and the type of licence. It is not required to change the marketplace for the AMZScout extension. It works on the Amazon marketplace for which you launched it in. The AMZScout extension for Chrome doesn’t have an option to change the password, since you log in using third-party accounts. To change the password for the extension you need to change the password for the appropriate account. How can I upgrade to AMZScout Basic to Pro? If you use AMZScout extension Basic and you want to upgrade it to Pro, you can do it directly from the extension. You will see big orange button on the right bottom of the extension window. Once you click it, you will be redirected to Chrome Store where you can install and buy it.